Designs on the front of the glass only. 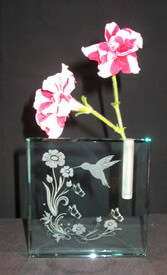 This lovely jade glass stem vase block is perfect for any occasion; you can have it as in the picture, or customize it with any text and/or design you'd like. Fell free to email us your ideas and we'll be happy to work with you to make it perfect!